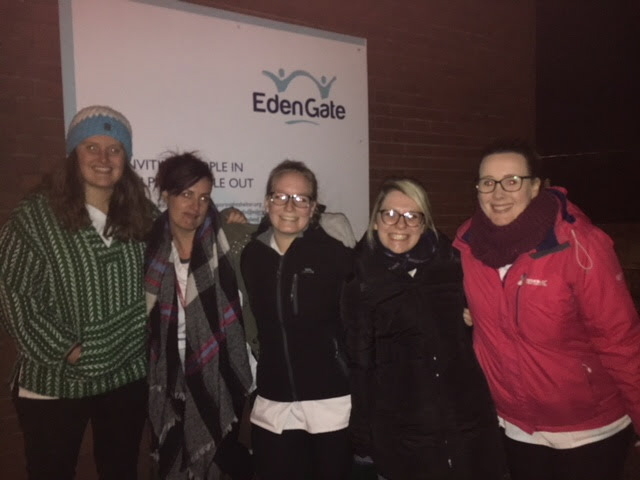 A group of final year Podiatry students are offering their services at Eden Gate, a drop-in centre and charity for homeless people in Newport city centre, to help tackle the physical problems that arise from homelessness. Podiatrists are health care professionals who have been trained to prevent, diagnose, treat and rehabilitate abnormal conditions of the feet and lower limbs. The group of podiatry students from Cardiff Met visit the Eden Gate drop-in centre with a qualified member of academic staff and a member of staff from Cardiff and Vale University Health Board. Natalie Pitman, one of the volunteer podiatry students, said: “When many people are asked to consider the health issues homeless people experience, mental health problems and drug and alcohol abuse usually come to mind first. But not many would consider just what living on the streets can do to their feet, and how serious the problem can get. The students offered to wash people’s feet in warm soapy water, dried them with clean towels, cut their nails and filed away any hard skin or corns. They were also able to provide clean socks and thermal shoe liners thanks to some generous clothes and toiletry donations from their course mates. Natalie commented: “We didn’t do anything ground-breaking, but just offering physical human contact, clean and dry feet and a sympathetic listening ear was enough to mean something. I have never encountered patients so appreciative. The group is planning to go back later in March and every six weeks after this to ensure continuity of care. Cardiff Metropolitan’s Wales Centre for Podiatric Studies is the only centre for the education of Podiatrists in Wales and as such, is supported by the Wales Assembly Government. It also offers a wide range of high quality podiatry services to the general public, as part of the clinical training for the students.